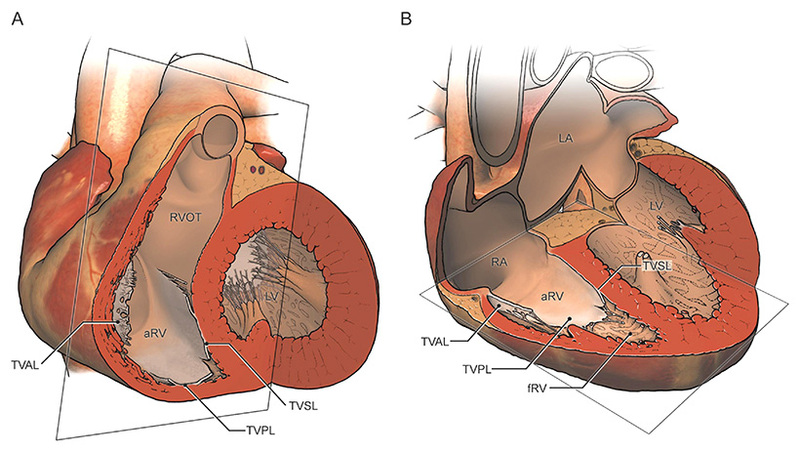 Illustration of heart with Ebstein anomaly demonstrating views of tricuspid valve from (A) short axis and (B) axial imaging. Labels: aRV, atrialized right ventricle; fRV, functional right ventricle; LA, left atrium; LV, left ventricle; RA, right atrium; TVAL, tricuspid valve anterior leaflet; TVPL, tricuspid valve posterior leaflet; TVSL, tricuspid valve septal leaflet. I worked with cardiologists to create illustrations used in a paper that described the role of cardiac magnetic resonance (CMR) imaging for the assessment of Ebstein anomaly. The paper and illustrations aimed to help the audience better understand the following two things: (1) The pathological structure of the right side of the heart in patients with Ebstein anomaly, and (2) The relationship of structures visualized in two-dimensional radiographic planes with the three-dimensional structure of the heart. Yalonetsky S, Tobler D, Greutmann M, Crean AM, Wintersperger BJ, Nguyen ET, Oechslin EN, Silversides CK, and RM Wald. 2011. Cardiac Magnetic Resonance Imaging and the Assessment of Ebstein Anomaly in Adults. American Journal of Cardiology Volume 107:5, 767-773.